Own, an original painting created by Vincent Farrell! 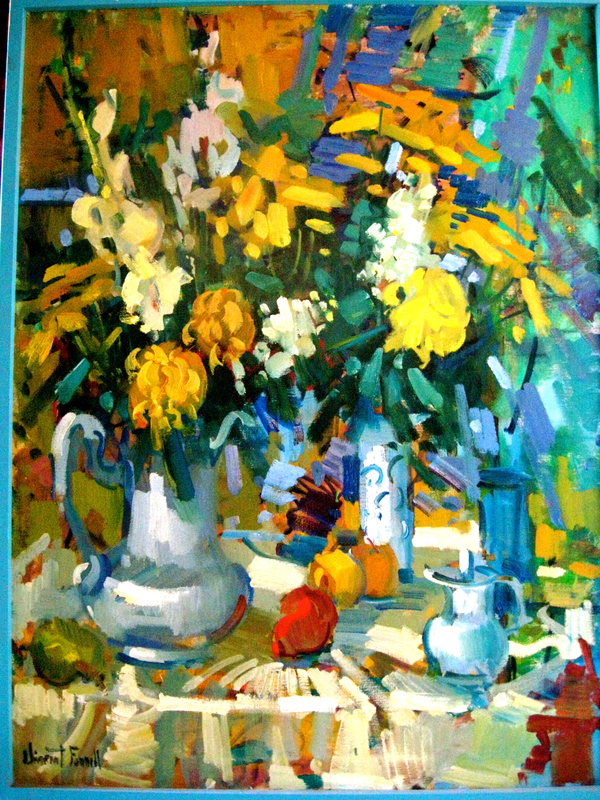 Yellow China mum flowers & white gladioli flowers with fruit are the subject matter of this high contrast and colorful still life created by artist Vincent Farrell. This painting’s dimensions are 30″ x 40″. Painted in approximately 1972 or 1973 and in excellent condition, this gorgeous painting is available for purchase for the very first time and is offered exclusively here on our blog, for inquiries please email us at artistvincentfarrell@yahoo.com. This entry was posted in Art, Art as a Lifestyle, Art for the Home, Art Market, California, California Artist Vincent Farrell, Design, Love, Music, News, politics, Shopping, Vincent Farrell Artist and tagged Art, arts, floral still life paintings, for sale, Gladiolus, Painting, Shopping, still life, Visual Art by vincentfarrellartist. Bookmark the permalink.